Switzerland is generally regarded as one of the World's leading situs for arbitration proceedings. The membership of the Swiss Arbitration Association (ASA) is graced not only by Swiss arbitrators but also by many of the world's best-known arbitration practitioners. The Statistical Report of the International Chamber of Commerce (ICC) has repeatedly ranked Switzerland first for place of arbitration, origin of arbitrators and applicable law. Notices of publications important fro arbitration practice, including articles in other reviews and An annual index in English, French and German. Each case and article is published in its original language with a comprehensive head note in English, French and German. 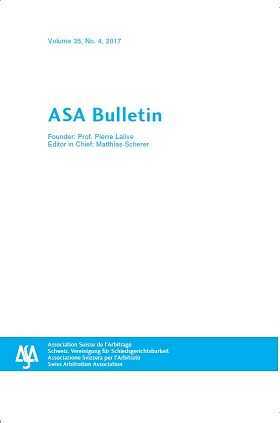 The ASA Bulletin is among the most refreshing, original and international of all international arbitration reviews. It has become an indispensable reference tool for all practitioners involved in international arbitration.